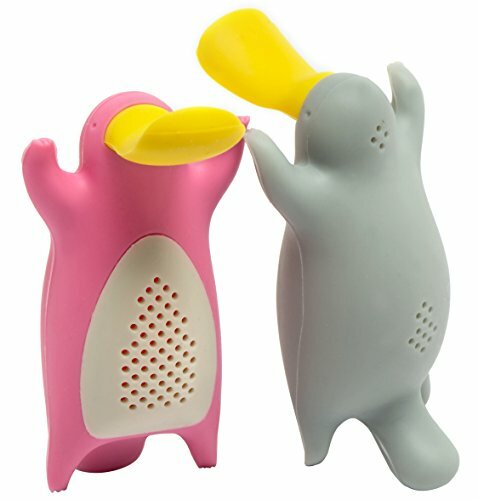 Tea Infuser Gift Set for Loose Leaf Tea, Cute Platypus Tea Strainer Pair in Lovely Gift Box, Ideal Couples Gift, Set of 2, Grey and Pink by MiraMiko at Jakis Cafe. MPN: 43219-27386. Hurry! Limited time offer. Offer valid only while supplies last. Brews The Perfect Cup: Mr. & Mrs. PlaTeaPus "hang out" on the rim of your cup while your tea steeps! Tea strainer design prevents leaf bits from escaping. Made Of Durable, Food-Safe Silicone: Use again & again! Won't rust or discolor like a metal tea ball chain or add an unpleasant taste to your tea. A Fun & Unique Gift: Don't know what to get for that special tea lover in your life? Surprise them with a gift that's both adorable & functional! This Tea Infuser Set is the Perfect gift for couples/couples gifts or any tea lover. Easy To Use: Just pop open their bellies, fill them with high quality loose leaf tea & place them in hot water. Easy to remove without burning your fingers. Lifetime Warranty: If Mr. & Mrs. PlaTeaPus give you any trouble at all, let us know and we'll replace your tea infuser set, free of charge! If you have any questions about this product by MiraMiko, contact us by completing and submitting the form below. If you are looking for a specif part number, please include it with your message.